The sun set on the North Pole more than a month ago, not to rise again until spring. Usually that serves as a cue for sea ice to spread its frozen tentacles across the Arctic Ocean. But in the depths of the polar night, a strange thing started to happen in mid-October. Sea ice growth slowed to a crawl and even started shrinking for a bit. Intense warmth in both the air and oceans is driving the mini-meltdown at a time when Arctic sea ice should be rapidly growing. This follows last winter, when temperatures saw a huge December spike. Sea ice extent using JAXA satellite measurements. Even in an age where climate change is making outliers — lowest maximum sea ice extent set two years in a row, the hottest year on record set three years in a row, global coral bleaching entering a third year — the norm, what’s happening in the Arctic right now stands out for just how outlandish it is. “I’ve never seen anything like it this last year and half,” Mark Serreze, director of the National Snow and Ice Data Center, said. 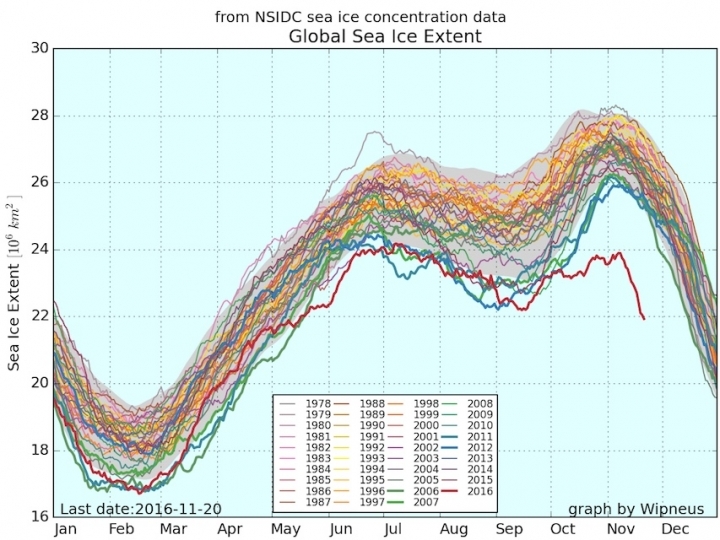 The latest twist in the Arctic sea ice saga began in mid-October. Temperatures stayed stuck in their September range, pausing sea ice growth. By the end of the month, the Arctic was missing a chunk of ice the size of the eastern U.S. The oddness continued into November. A large area of the Arctic saw temperatures as much as 36°F above normal, further slowing Arctic sea ice growth and even turning it around for a few days. In other words, it was so warm in the Arctic that despite the lack of sunlight, sea ice actually disappeared. “​The ridiculously warm temperatures in the Arctic during October and November this year are off the charts over our 68 years of measurements,” Jennifer Francis, a climate scientist at Rutgers University who studies the Arctic, said. Compounding the warm air is warm water. Sea surface temperatures on the edge of the ice are also running well above normal in many places, further inhibiting sea ice growth. As a footnote, Antarctic sea ice is also record low, making for a really dire global sea ice graph. The two regions’ current conundrums aren’t connected, and researchers are still trying to untangle what’s happening there. But in the Arctic, a number of factors — both driven by climate change and weather patterns — are to blame for this year’s bizarre sea ice situation. Global sea ice extent is also at a record low. First, Arctic sea ice itself has some issues. Old ice has all but disappeared since record keeping began in the 1980s, and the majority of the ice pack is now young ice that tends to be more brittle and prone to breakup when extreme warmth strikes. Some of that warmth came courtesy of the tropics where convection patterns created a series of large troughs and ridges in the atmosphere. The pattern that set up in mid-October put the eastern edge of one of these troughs over northeast Asia, according to Paul Roundy, an atmospheric scientist at the University at Albany. The ocean heat has roots in this summer, when dark open water absorbed the sun’s incoming energy (compared to white sea ice, which reflects it back into space). Francis said this “not only slowed the freezing process, but also warmed and moistened the air. That extra moisture is very important because water vapor is a greenhouse gas and it also tends to create more clouds — both of these effects help trap heat near the surface.” It’s what Serreze said was a “double whammy” of warming causing the current meltdown. This all follows what was the second-lowest sea ice extent ever recorded in September and what has been a persistent dwindling of Arctic sea ice for decades on end as climate change cranks up the heat. The Arctic is warming twice as fast as the rest of the planet and it’s possible that the region could see ice-free summers as early as the 2030s. If carbon pollution continues at its current pace, it would likely make ice-free summers the norm by mid-century. Going forward, Serreze said research should focus as on how an already changing Arctic system responds to these types of shocks. “A valuable way of viewing Arctic system now is (looking at) how it responds to these extremes. Has their impact changed now that Arctic has changed?” he said.